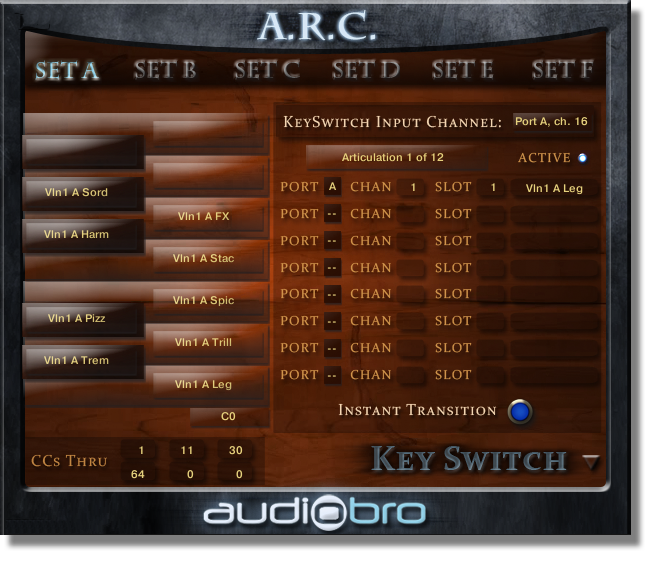 The ARC Key Switch (KS) feature is a very powerful tool that will allow users to maximize the use of Kontakt on all banks when Key Switching. No longer does one have to use Kontakt Instrument Banks to enable Key Switching. Now you can load all your patches into Kontakt as you normally would and with a single “Key Switch Input” MIDI channel, you can KS up to 64 patches. Also, if you do decide to use Instruments Banks on top of it, you can KS between 64×32 = 2048 patches. Of course that is extreme… but if ever someone wanted to… technically they could. TIP: The ARC’s KS allows you to do what other KS systems don’t. It lets you set up your patches in Kontakt as regular non-KS patches and play them from individual sequencer tracks AND also lets you have a dedicated KS track that plays ALL of your patches from 1 MIDI Channel – simultaneously! What this means is you can have the best of both worlds: Individual access to all your patches on separate MIDI channels for layering, AND Key Switching between patches from a dedicated KS MIDI channel of your choice. Please watch our online video tutorials (coming soon) to help you get a better understanding of the Key Switch page as well as other ARC features.